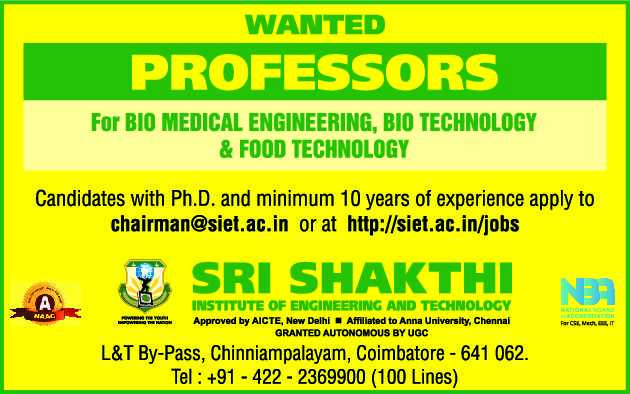 Sri Shakthi Institute of Engineering and Technology, Coimbatore has advertised in the THE HINDU newspaper for recruitment of Professors jobs vacancies. Interested and eligible job aspirants are requested to apply immediately from 03rd April 2019. Check out further more details below. About College: Mission and Vision- To make the institution one of our nation's great engineering schools, recognized nationally and internationally for excellence in teaching, research and public service. We seek to be the preferred destination for students, practitioners seeking an engineering education, employers hiring engineering graduates and organizations seeking engineering knowledge Our vision is to Provide an encouraging environment to develop the intellectual capacity, critical thinking, creativity and problem solving ability of the students. How to Apply: Interested candidates are requested to send their CV along copies of certificates and recent PP size photo to the email address provided below or apply online.